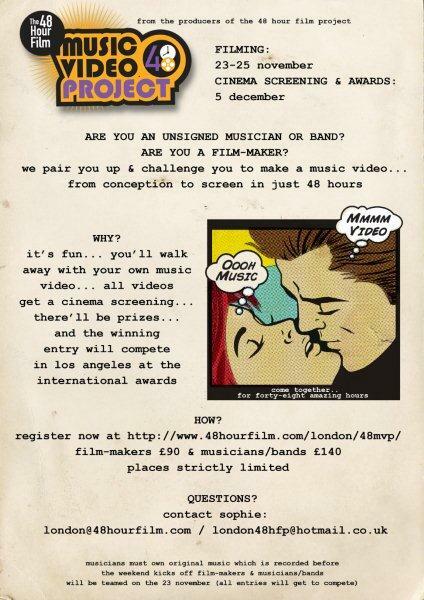 The 48 Hour Film project is a competition where accomplished filmmakers are paired with unsigned bands to make a music video in 48 hours.On Friday 23rd Nov 2012 they will be teaming unsigned bands with film-makers and challenging them to make a music video – from conception to filming to edit to screen in just 48 hours. There is an entry fee of £140 involved but Rock Bands in London members can get £10 off the entry fee. It’s a great opportunity for bands to get a high quality music video made for a small fee in a very short amount of time. The London leg of this worldwide competition takes place on the 23-25 November with screenings at the Prince Charles Cinema off Leicester Square and wrap/awards at the Phoenix Artist Club. They have lots of filmmakers but would love some more artists/bands, so get in touch with them asap through their website. Click on the flyer for more info. It is unbelievable that there really is no information out there in the cyber world for a London specific way of doing gigs, how to market your band and genuinely honest advice to guide you through the often heartless world of making and selling your music in this big bad city. So I got down Kunal who runs Chaos Theory Music and he has booked hundreds of bands. His company has grown by leaps and bounds in the last 2 years. Normally musicians always see London promoters as slimy figures who actually don’t do any promotion work whatsoever and put random bands with each other to run a night. I’ve certainly had my fair share, from being given tickets to pre-sell to the promoter disappearing with my band’s cut of door ticket sales while the night was still running! But Kunal is a spectacular exception. In this candid talk and discussion that took place at our last meet-up, he talks about a range of things from how a band can score their first gig to what his experience tells him that a driven and motivated band actually does to promote themselves. And also on which gigs bands should play, how often and what types of gigs to avoid. He gives plenty of real life examples to back it all up with names of bands he’s worked with. So get your pen and paper out and start taking notes immediately for the only video that tells you what the London scene is REALLY like. The video is in two parts. The first part is the bulk of the talk and the second one is an after talk Q&A session.